There are still many things we don’t know about our planet and the life forms it has created to help clean up our mess. These microbes and bacteria could play a major role in saving a lot of marine life, as they are key to breaking down toxic chemicals and biodegrading what was once thought of as non-biodegradable. So, there is hope for cleaning up the plastic garbage patch after all. Groups of scientists from around the world are astonished at this phenomenon. Basically, what happens is that when pieces of plastic are colonized by microbes, a protective film is created around them. This protects the species that will eat them from potential toxic effects of the plastic. 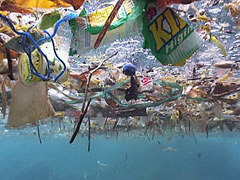 There is also evidence that suggest the microbes will assist with the break-down of plastic in this way as well. Another life form that was discovered to help our oceans is the pseudomonas bacteria, which can help transform the low-grade plastic from our bottles into plastic that is biodegradable. This discovery could also aid with the billions of bottles that are currently overflowing our landfills. So, these bacteria could not only help our oceans, but our land as well. Posted on June 14th under Pollution Reduction.